The Senate passed a tax bill that includes a beneficial component for developing the biomass power industry--a continued Section 1603 Program, which extends the start-of-construction deadline for the for the cash grant in lieu of tax credit program. In a move that has the biomass industry talking, the U.S. EPA has filed a motion with the federal District Court for the District of Columbia seeking an extension of the current schedule for issuing the Maximum Achievable Control Technology rule. A recent government report has targeted wood pellets as one of the most promising export markets for U.S. companies, and the USDA intends to expand its annual report on biofuels to include analysis on wood pellets and chips in relevant countries. The U.S. Supreme Court will hear an appeal from five of the country's largest power companies, together challenging a ruling by the federal appeals court in New York that they can be sued to curb their carbon dioxide emissions. Taylor Biomass President and CEO Jim Taylor officially broke ground on a 20-megawatt biomass gasification plant in Montgomery, N.Y., on Dec. 6, accompanied by project supporters U.S. Sen. Charles Schumer, D-N.Y., and Rep. Maurice Hinchey, D-N.Y. The U.S. has tremendous untapped potential for biomass-fired district heating networks. 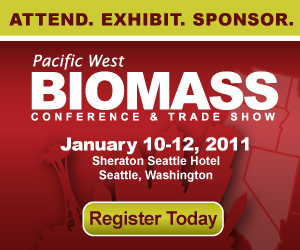 Tour participants at the Pacific West Biomass Conference & Trade Show in Seattle will have the opportunity to see firsthand how such an operation functions. The Florida Power Plant Siting Board, composed of the governor and the independently elected members of the Cabinet, unanimously approved the site application for Gainesville Renewable Energy Center's proposed biomass power plant in Gainesville. The Biomass Power Association applauds the U.S. EPA for extending the deadline for decision on the re-proposed boiler MACT ruling. This delay will allow the EPA to thoroughly assess the potential effects of this rule across the United States.